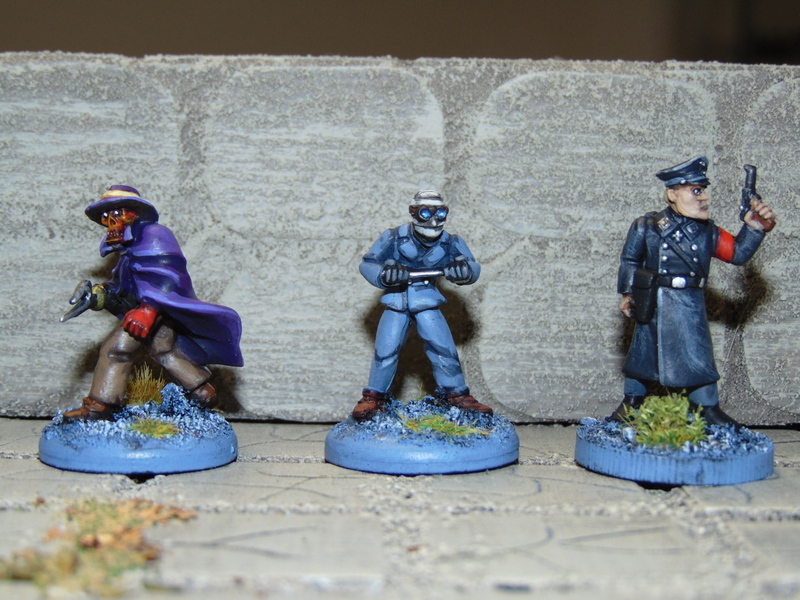 Movember continues with more pulp-themed miniatures. This time around, my last remaining Pulp Figures: some Weird Villains! You can barely see Dr. Price’s “John Waters” mustache; but fear not, I have painted a miniature with epic facial hair in honor of Movember! Stahl-Mask’s walrus mustache is legendary; it’s a shame you can’t see it under his, well, his stahl-mask. 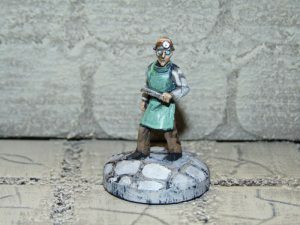 Stahl-Mask is one of only a few Pulp Figures with more than one sculpt (Dr. Koo is another). I’m pretty sure this is Bob’s original version of the dastardly German, but I could be wrong. You may notice my Creeping Claw has a hook for a hand. This is my own addition. My miniature was missing his right hand, so I used the hook from the Heroclix Aquaman I cannibalized earlier this year to make my Aquarian submission for Forgotten Heroes (I never throw anything away). I like the way it looks; very pulp villain-ish. And now he has an actual claw! Up next: some pulp doctors! 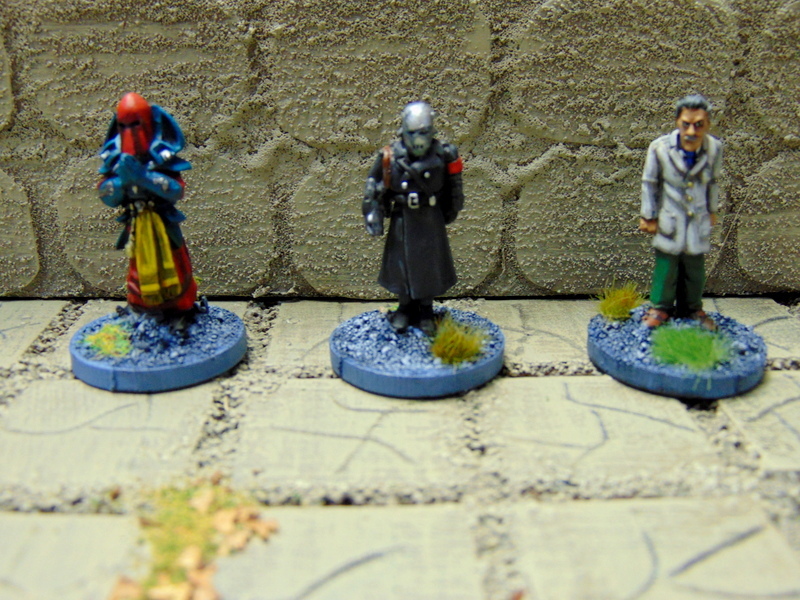 These three are from RAFM‘s old Call of Cthulhu line, and I’m pretty sure they’re also sculpted by Bob Murch! (Small world, eh?) These guys were a lot of fun to paint. 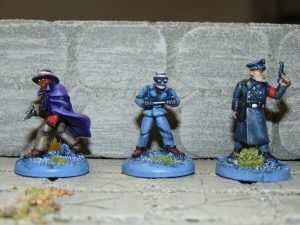 I’m glad I decided to bang out all my pulp models this month, otherwise these fellows were likely to remain pretty low on my priority list. I really like the guy in the middle, as he could easily work for an Old West sawbones just as well as a pulp-era physician. This is a “before” shot of the surgeon, as in “before he applied serrated blade to his grisly work.” (Actually, I just like how this picture came out, so I figured I’d include it.) For the blood, I used Citadel’s Blood for the Blood God technical paint, which is awesome (IMHO). 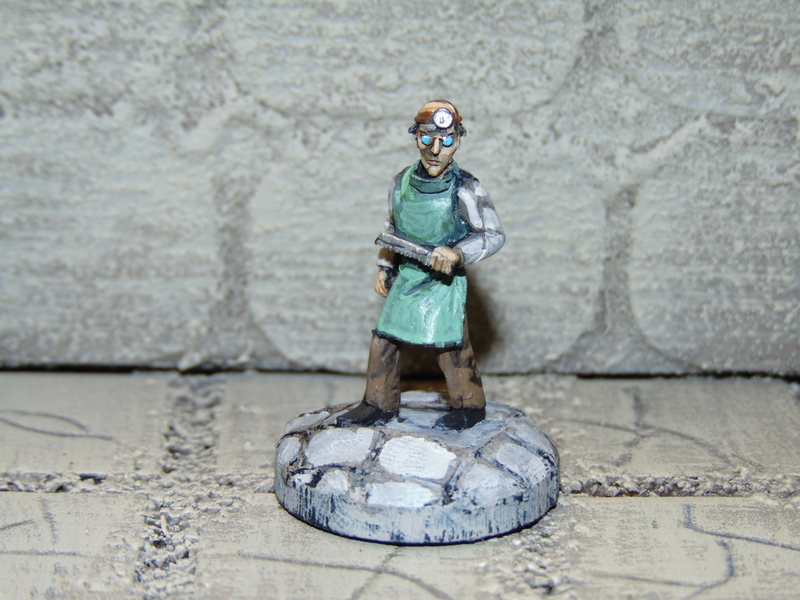 Lastly, another “doctor” of sorts; this one a professor of Archaeology! 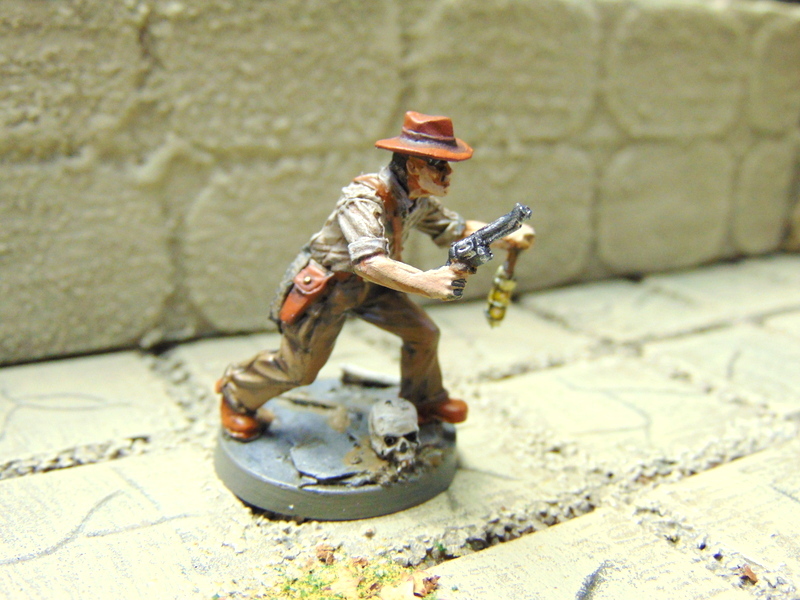 Another RAFM miniature, this is “Drake Harrington”, from their new Call of Cthulhu line. 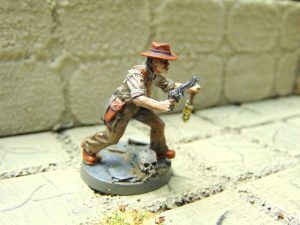 His resemblance to a certain whip-wielding archaeologist isn’t accidental, I’m sure (even though there’s no whip to be seen). I like the miniature, but I would have liked some variety in his hand choices. I’m not wild about the lantern, mainly because I can’t paint object source lighting effects very well. I added this rope to the model because I think it looks cool. Then I mounted him on a scenic base, which unfortunately contains a human skull with dimensions noticeably bigger than Drake Harrington’s own head. Oh well. Next post: some real dummies! « Movember is Pulp Month! 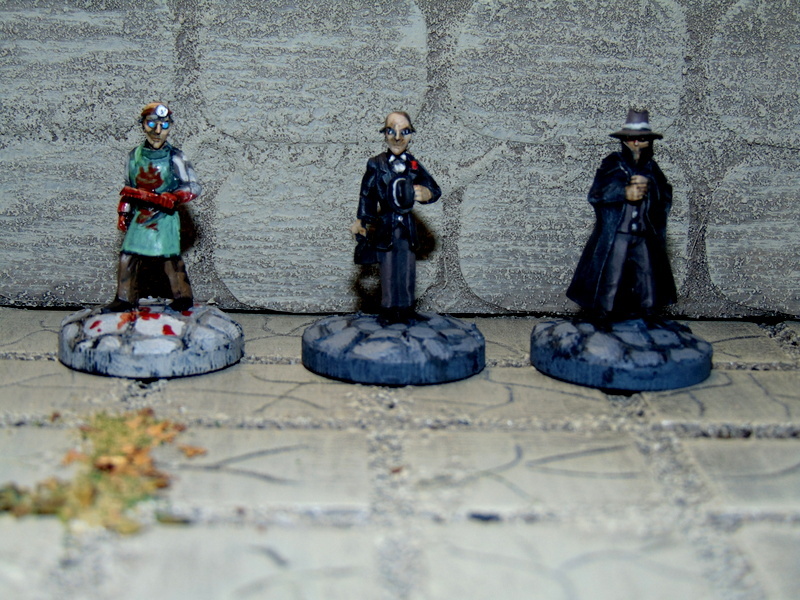 A very cool selection of malevolent miscreants. I’ve always had a craving to do a bit of pulp gaming, but based on the “Universal Monster” of the 30’s. I think I’ll have a bit of a browse and see if I can find a suitable figure to represent “Brick” Barton, dashing 30’s hero and rescuer of damsels on distress. 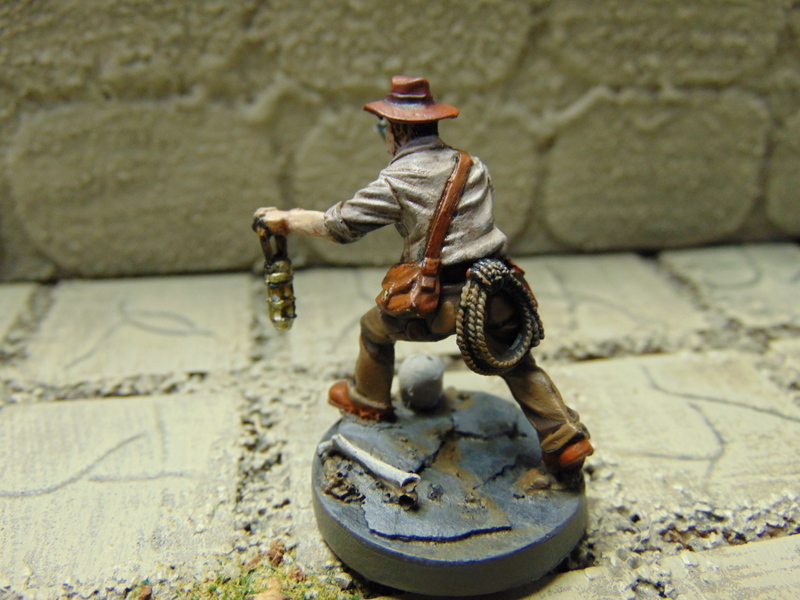 Look no further than Bob Murch’s Pulp Figures, Jez. Should be able to find a suitable “Brick” Barton there, and Bob just started a new line of the Universal Monsters you know and love! I’m sorely tempted to pick up his Frankenstein set!